Having been founded in 1997, through consistent challenges and limitless passion, Mirae Technology has pursued specialized IT authentication security technology development and differentiated service R&D to become the leader of innovation and growth in the financial security industry. As the leading company of Korea's OTP authentication security area, from its foundation in 1997, Mirae Technology has pursued specialized IT authentication security technology development and differentiated service R&D with consistent challenges and limitless passion to become the leader of innovation and growth in the financial security industry. We are persistently developing and launching diverse authentication products such as the world's first time synchronous method card type OTP, vocal support OTP for those with visual disability and BIOTP using FIDO biorhythm information. We are always trying our best for the creation of innovative IT security service in diverse areas such as companies and the public as well as for the construction of safe authentication security system based on diversity and convenience. 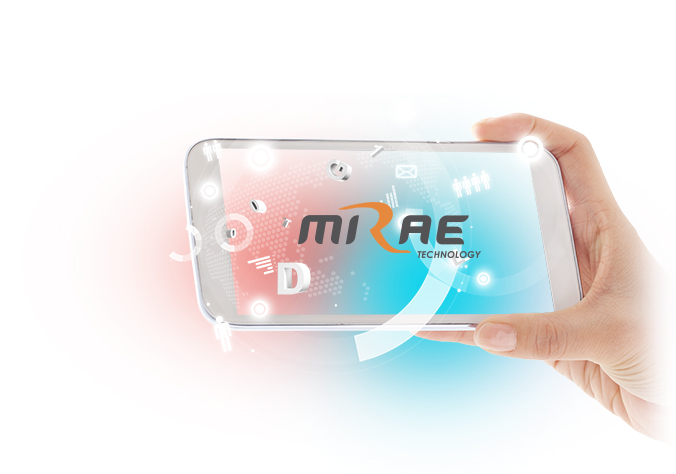 ‘Mirae Technology aims for an abundant life based on human centered advanced technology'. By introducing the total solution type R&D planning, we have grafted recent ICT to the existing technologies. Moreover, by participating actively in diverse platform development other than security authentication business, we will fulfill our responsibility and obligations as an IT Service Partner. ‘Mirae Technology’ will always be a company that does not fear challenge with limitless passion towards the new paradigm of the Industry 4.0. At the head of the fourth industrial revolution centered on people and realized through science technology and ICT will be ‘Mirae Technology’.